Over the years, I have designed several products for the kitchen and for baking. My first product venture was a thermometer because I did not trust the accuracy of those that were available. I marketed and even shipped them on my own. In several of my books, I have included a nonstick doughmat by American Products Group. In 2014, Dan O'Malley, approached me about designing a doughmat with my pie crust recipe and baking tips on it. The rest is history, resulting in an every growing line of original and invaluable products of the highest quality. NORDICWARE is most known for creating the bundt pan. I love their line of cast aluminum non-stick bundt-style pans in myriad shapes. They make it possible to produce stunning cakes that require no frosting for adornment. 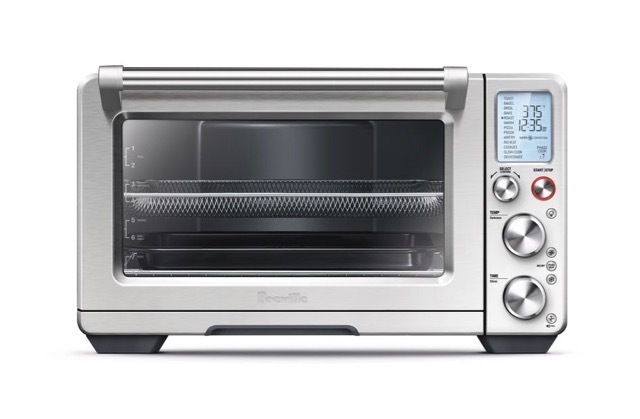 BREVILLE has taken tabletop ovens to new and reliable levels. I use my Breville more than my large ovens. The second product was my dream pie plate, with a deeply ruffled edge that makes it easy for anyone to have a beautiful border on their pie crust. I was thrilled when Harold Import agree to carry it in their line of baking equipment along with other designs I later created. Most recently I started working with APG on a new line of bakeware. And I am also sharing with you here, products that I have discovered from other manufacturers which I have used extensively and value greatly for my baking and cooking. These manufacturers have consistently produced reliable and top quality products. Click on Portals to product pages. THERMOWORKS When i need an instant-read thermometer, I reach for my Thermapen. It is dead on accurate and quick to respond. It gives the word "instant" its true meaning. I also admire their entire product line of top quality equipment. Fat Daddios out of Seattle has virtually any shape, and size, and cake pans. They also manufacture many other useful baking tools. POURfect measuring spoons, beakers, and dry measures are indeed exactly that, and the reason I know is that I helped design them. I have been with Harold Imports since 2005. My signature porcelain pie plate has been one of my proudest creations and was listed in America's Test Kitchen magazine as number 1. I also couldn't bake cake layers without my silicone cake strips, and I use my mini cake pan not only for little cakes and financiers, but also to mold chocolate for making chocolate curls. GOBEL makes, hands down, the best nonstick tart pans in a large variety of sizes. BROD & TAYLOR make a countertop proofer for making bread proofing a breeze. It fold flat for easy storage. USA PANS are my top favorite cake pans, muffin pans, bread pans, and sheet pans.